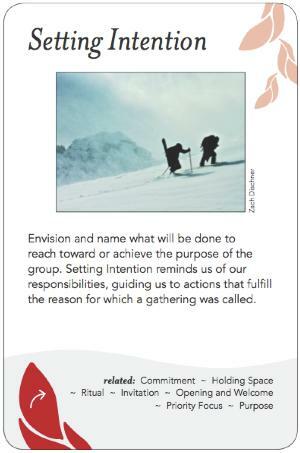 Envision and name what will be done to reach toward or achieve the purpose of the group. Setting Intention reminds us of our responsibilities, guiding us to actions that fulfill the reason for which a gathering was called. Intention & purpose drive the whole agenda of group process, fractally. Intention set beforehand by the convenors drives the invitation process, how it's framed and who is invited. Then, intention set at the beginning of a meeting (transparently, with participants) sets the agenda and collective 'contract' for the meeting. Setting a clear intention for each activity within the meeting can also help to ensure that you get the most out of the time together. If a meeting goes awry or off-track, the group may get back on track by being reminded of the intentions set at the beginning. Organizationally, intentions come up as overall mission, then a particular objective or goal to achieve that mission. However, intention is more than a goal, an objective, a hope, an expectation or a resolution. The word means etymologically "stretching toward" and intention has commitment to action, acceptance of responsibility, and a beginning, a setting-in-motion in the right direction inherent in it. Often, no specific desired outcome can be determined at the beginning of a session, and setting intention is more aligned with process than with content or outcome. People will also have their individual intentions -- for example the facilitator, to be Letting Go throughout the session. The setting of intention can be facilitated by an opening exercise that describes the qualities to bring or a way of being in the workplace. Effective intentions are supported by a shared understanding of the group's purpose, and honesty about what is realistically achievable. They are more likely to be enacted if everyone has had a hand in forming them, and feels genuinely invested, and if there is an acknowledgment of collective responsibility. This "stretching toward" might carry the group or some participants outside their immediate comfort zone, so the facilitator needs to be alert for anxieties or disengagement if this occurs. Generally, in grappling with complex challenges and issues, the facilitator and the group may not know exactly how the intention will be realized, but by naming they've already started toward it. The group may need to be encouraged to draw on its individual and collective intuitive capacity, tuning into the spirit of the moment and the collective energy of the group. Intention reminds us to come from our better selves. Intentions set must be realistic, and the group must be willing to take the collective responsibility for reaching (towards) it - you can only move the goalposts twice before people stop believing in them. Alice: I was just wondering if you could help me find my way. Cheshire Cat: Well that depends on where you want to get to. Cheshire Cat: Then it really doesn't matter which way you go, does it? Many organizations use a visioning process, or scenarios, to imagine the 'future state' they would like to see in their organization. That vision then becomes the basis of the intention of the group -- they may not know how to get there (yet), but they have a shared vision of where they want to go. I am now persuaded that the pattern Intention extends beyond just 'setting' intention, and includes clarifying intention, recalling intention, and appreciating what differences of intention mean in terms of structuring and facilitating an interactive activity. There are several types of intentions for different types of interactive activity. For example, I can see several types of collaborative-activity intentions (such as decision-making, conflict-resolution, information-sharing, idea-generating and insight-producing), and several types of intentions for less-collaborative activities (such as instruction dissemination, data-gathering, information disseminating and carrying out of ritual/ceremony). Each type of intention has distinctly different work-products and outcomes and each suggests a different focus and process for the activity. I think it's essential that the facilitator and participants remain aware of intention (and what that intention should produce) throughout the activity, and would like to see this pattern broadened to capture this.